Ancient Greek art is the foundation of culture in many countries all over the world, in particular concerning sculpture and architecture. Angiography started emerging around 1050 BC and developed over the ages. Initially its theme was geometric elements which are prevalent in ceramics dating to the period 900 – 700 BC. The next major step originated in Corinth and was first used around 700 BC; it is called black – figure style and reached Athens around 630 BC, where it became the main angiographic style for the following century. Using black paint on top of the light color of the clay, the main theme during this period was mythology, heroes and feats. Black – figure pottery eventually evolved and around 530 BC, a new style emerged, the red – figure pottery. At this period, the coloring was the exact opposite of what was before; black ceramic vases with red decorative elements, once again drawing their theme from mythology. Another important part of Ancient Greek Art was sculpture. They were made of two types of material, stone such as marble or limestone, or bronze. Bronze was used for high – status projects, but very few sculptures remain today, because bronze was reused for other purposes. Of highest regard were sculptures with gold – and – ivory, or chryselephantine, but none survive today. 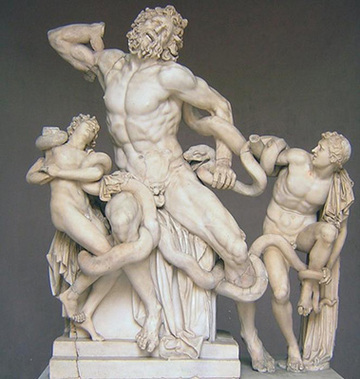 The evolution of sculpting is evident in various surviving sculptures. During the Archaic period, all statues and sculptures had a solid and rigid stature, and their arms were close to the body; however, they were particularly detailed in terms of anatomy and representation of the human figure. Characteristic examples of this period are the kouroi, standing male nudes, and the korai, standing clothed females. During the Classical period, sculpting evolved considerably and significant changes were made in terms of style and function. The poses were more naturalistic and the arms were no longer restricted on the body; this was also the period of some of the most important monuments of Classical Greece, including the Parthenon, the Temple of Zeus in Olympia, as well as the Parthenon Marbles. During the Hellenistic period, i.e. the period after Alexander the Great’s death, Greek art spread all the way to India; as a result, it was hugely influenced by different techniques and aesthetics. The skill of Hellenistic sculptors vastly improved, as it can be evidenced by sculptures of the period, including the Winged Nike of Samothrace, Aphrodite of Melos (or Venus de Milo) and Laokoon and his Sons. Although the themes of these sculptures refer back to Classical Greece, they are far more naturalistic and detailed than examples of that period.